A mural in the Hope District of Detroit. On the sidewalk, Pastor Barry Randolph from the nearby Church of the Messiah held up a megaphone. He led a call-and-response with the crowd, chanting, "It's our neighborhood and our street." A silence the violence march on Detroit's east side. Andrea Clark marched in the middle of the pack. She wore red and white, like she always does. The white represents an angel and the red, blood. Clark is a veteran of anti-violence marches like these. She estimated she's been to more than 50. For Clark, these public demonstrations are deeply personal. In 2011, her son Darnell Perkins was killed by a private security force during an altercation outside a club in downtown Detroit. After he died, she was desperate for an outlet for her grief. “I needed a reason to live. I needed a reason to go on,” Clark explained. And so three months after Darnell's death, she founded the group Mothers of Murdered Children. It’s been five years since Clark lost her son. Since then, she’s grown MOMC into a group of 45 active members. They meet every other Saturday at the same eastside church that organized the anti-violence rally. It’s been years since some of the members lost their children. For others, it’s been only a few months. A lot of the moms in the group are still waiting for their children’s killers to be caught. Many of the women, like Clark, have found in the group a way to channel the trauma of their loss into community advocacy. Right now, the group is working to get homicide declared a public health crisis. That designation would make Detroit eligible for federal funding for more mental health treatment. Mental health is an important part of the conversation about criminal justice in America. Between 60-75% of people in jails and prisons in this country suffer from some kind of mental health issue. The most important thing that these moms do together, though, is grieve. And in this group, Clark told me, all children matter. The meetings are a non-judgmental space to talk about the pain of losing a child, no matter the circumstances of his or her death. “Whether he was the drug dealer or the man standing on the corner and got robbed for his glasses. All mothers who have lost a child to violence and to murder are welcome in our group. Cause our children are on the same level right now. They’re not here,” said Clark. Detroit is far from the only city grappling with deadly gun violence. But it might surprise you to learn that, despite popular perception, crime rates in America have been falling since the early 1990s. And Detroit has, to some extent, mirrored the national trend. In 2015, the city recorded the fewest number of criminal homicides in decades. Still, the city’s murder rate remains 10 times the national average. And Detroit routinely tops the list of the nation’s "most dangerous" cities. Whether you live amid the violence or just hear about it on the news, it can be easy to think of murders as inevitable in poor, inner-city neighborhoods. But historian Heather Ann Thompson cautions against that view. “By normalizing it and making it seem as if it’s just synonymous with inner-city living, we totally miss the fact that this is a created crisis, that the drug war and mass incarceration together have created the conditions where violence is not only regular, but actually guaranteed," said Thompson. Thompson argues that violence is a symptom, not the disease. Dealing drugs was one of the few ways for people to make decent money in Detroit neighborhoods that had seen industry, and the good paying manufacturing jobs that went with it, disappear. And so, the government's crackdown on drugs had far-reaching consequences in those communities. “It cannot possibly be that an entire generation of young African Americans, young black and brown people, in general, just simply lose their moral compass, lose their tethering to family, to community, to rationality. This is bigger than that. So what is the history of that? And that very quickly led me to understand this was a very clear policy choice we made to lock up everybody and criminalize everything. And for that reason, we can un-choose it," Thompson said. It’s clear Thompson has spent a lot of time thinking about these issues. And she has a long list of policy changes she thinks would make a difference. Getting rid of mandatory minimums and "three-strike" laws that significantly increase the length of sentences for people with previous drug charges would be a good start, Thompson said. But she thinks there's something much more fundamental that has to happen, too: a shift in the way we think about criminal justice. “If something terrible happened on the part of one of your children, you wouldn’t lock them up. You wouldn’t throw away the key. You wouldn’t put them in solitary confinement. You wouldn’t separate them from everyone they knew for 21 years. You would try to figure out what had created the crisis, what had created the problem. And work through some sort of restorative justice means for them to take responsibility for whatever that action was." 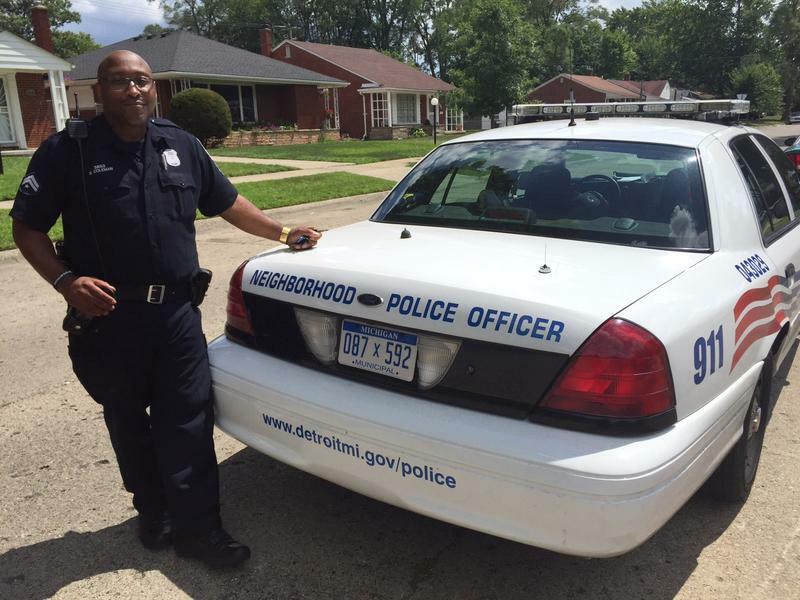 Thompson said that's the kind of attitude that would produce real and lasting change in Detroit's most violent neighborhoods. Terriyana Graham lives just two blocks from her bus stop. It would probably take the 11-year-old less than five minutes to walk there. But her parents, Terrance and Patrice, don't feel comfortable letting Terriyana make that journey alone. So every morning and every afternoon, they drive the two blocks down the street to drop her off and pick her up. The Wilson-Graham family on their front porch in Detroit's Osborn neighborhood. The Grahams moved to Osborn more than 10 years ago to be closer to Terrance's family. He grew up just a few blocks away from here. All of Terrance's extended family has since moved out of the neighborhood, but the Graham family is staying put. Patrice told me they’d love to move, but there’s no way they can sell their 900-square-foot house for anything near what they paid. The Grahams paid $80,000 for their modest bungalow just before the foreclosure crisis decimated much of Detroit's housing market. The home next door to them, which looks pretty similar, is currently on the market for $7,400. Despite the abandoned homes, the speeding cars and the lack of safe spaces for their kids to play, the Grahams were doing relatively well. They both had decent-paying jobs. Patrice is a nurse, and Terrance manages a kitchen at Applebee's. They were happily married in a city where 74% of households are headed by a single parent. And they were doing everything they could to etch out a safe and loving existence for their three kids: Martinus, Terriyana and Trinity. But on June 15 of this year, everything changed. Their oldest child, Martinus, was hanging out with two friends from his job at Applebee's. They were on Rohns Street, near Gratiot Avenue, on Detroit's east side. Then, the unthinkable happened. Detroit police got the call around 3 a.m.
Local television news described the scene as “a horrifying bloodbath.” Reports said the two gunmen used an AK-47 and a 40-caliber handgun and fired at point-blank range. Martinus Wilson and his friend Nathan Mosley died instantly. A third victim, 31-year-old Christopher Miles, survived. “A lot of times, in situations like this, you hear parents all the time say that their child was innocent, they was good,” said Terrance Graham. A makeshift memorial to Martinus Wilson, who was killed at age 20 in June of 2016. Just a few weeks ago, the Grahams stood surrounded by family and friends in a Southfield office building. They faced a bank of cameras and pleaded for the public’s help. “There’s no sugar coating it right now that our city is in a crisis,” Terrance Graham said during the press conference. “Our neighborhoods are destroyed, and we’re losing many young men. I don’t want to see another young man and another family, like me and my wife, have to go through the long nights that we suffer right now with the loss of our son." 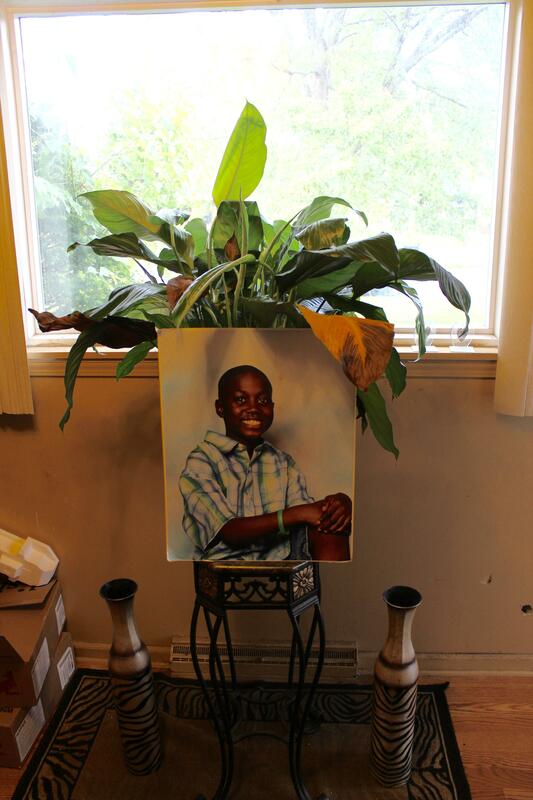 The Detroit Police Department reached out to the non-profit Crime Stoppers of Michigan, hoping a press conference might generate some anonymous tips on Martinus’ case. Local TV and radio stations played excerpts of the press conference. And the footage was sent out to every prison in the state, along with probation offices all over Southeast Michigan. 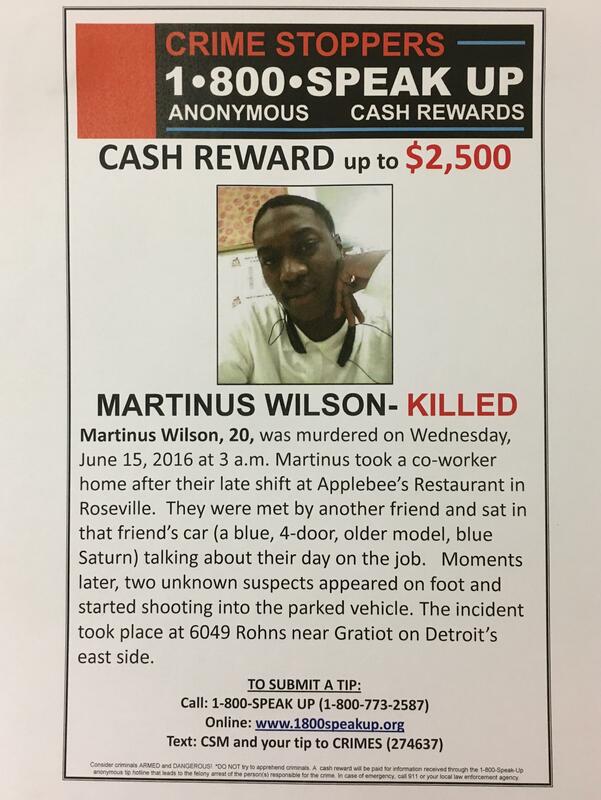 A cash reward for tips involving the homicide of Martinus Wilson. Terrance and Patrice say now, more than ever, they’re determined to move the family out of the neighborhood. Just a few months before Martinus was killed, Patrice and Terrance welcomed their third child into the world. They named her Trinity. “She depends on me. And if I didn’t have her who depended on me, maybe I would be in a different state,” Patrice said. Between work and the new baby, Patrice and Terrance have their hands full. But that hasn’t stopped them from taking on a new project inspired by their late son. It came out of a conversation Terrance had with Martinus when he was a junior in high school. Terrance remembers staying up all night with his son, plotting a way to help young men in their neighborhood. 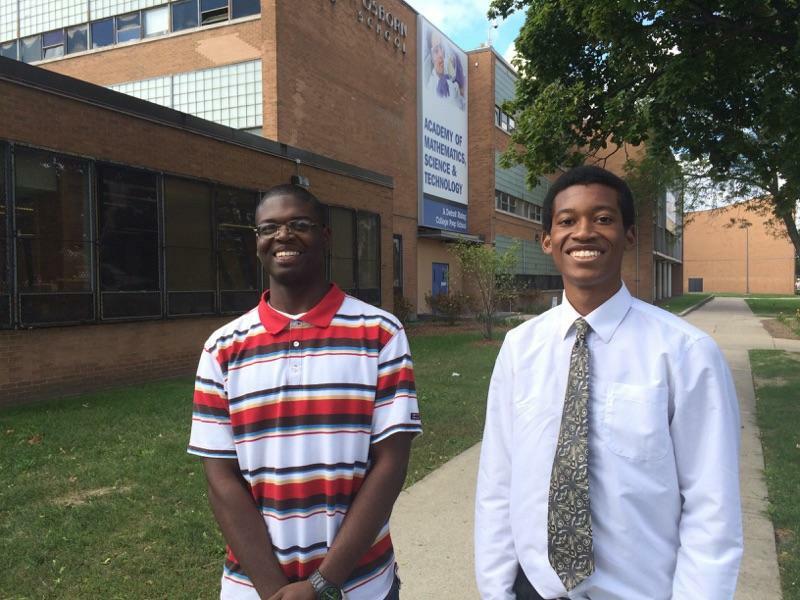 What if they started an organization, a kind of brotherhood, that would help these young people find their purpose? Terrance says Martinus had already found his purpose. He was a dedicated cook. He dreamed of eventually opening a restaurant. And he wanted to share his passion and help train other young men in the culinary arts. But his son didn't live long enough to make those dreams come true. Now, in the wake of Martinus' death, Terrance is making the organization he dreamed up with his son a reality. He's calling it Men of Purpose.The group's first members were mostly Martinus’ friends and Terrance's male relatives. The inaugural members of Men of Purpose, an organization Terrance Graham started in the wake of his son's murder. They meet at the Samaritan Center on the far east side of Detroit. Nine guys showed up to the most recent gathering. Terrance opened the meeting by talking about how it’s important, as a man, to talk about fear. As the group expands to men outside his immediate network, Terrance says he’ll continue trying to get the guys in the group off the street and into jobs and job training programs. But he wants to do more than just get them a job. As the organization’s names suggests, he’s trying to help them figure out their sense of purpose. In Terrance's quest to help them find it, he's scheduling individual meetings with to help them narrow down them put a finger on their hopes, fears and goals. After losing his son to gun violence this spring, Terrance is preaching life. He wants the men in his group to value life. He doesn't want to think of violence in their community as normal or inevitable. 28-year-old Stevon Mosley agrees with Terrance. He thinks it's important that young people living in the city don't see violence as an unavoidable consequence of living in Detroit. But he says sometimes, it can be hard not to. I met Mosley at a place called Feedom Freedom farm in Detroit, near the Grosse Pointe Park border. The lush green landscape is an oasis from the urban blight surrounding it. The farm emerged in 2009 as a reaction to the devastation seen all over Detroit. As a member of the Feedom Freedom collective, Mosley tends to the fruits and vegetables. He also runs the social media accounts. On the farm lives three generations of one family. The grandpa, Wayne Curtis, spends Saturdays teaching art to his grandkids and to any neighbor who wants to come by. He’s a talented artist who painted a lot of the murals you see on this street. Saturdays at the farm can seem idyllic, utopic even. But utopias don’t exist. We’re in Detroit, a city that reported 295 homicides last year. That’s why the Freedom Feedom Collective has been hosting a series of gatherings to talk about the impact of all the violence and what they can do about it. “I just couldn’t sit any longer and not pull people together who have like minds who really are sincere and really want to do something for real”, explained the meeting’s co-organizer, Sandra Hines. 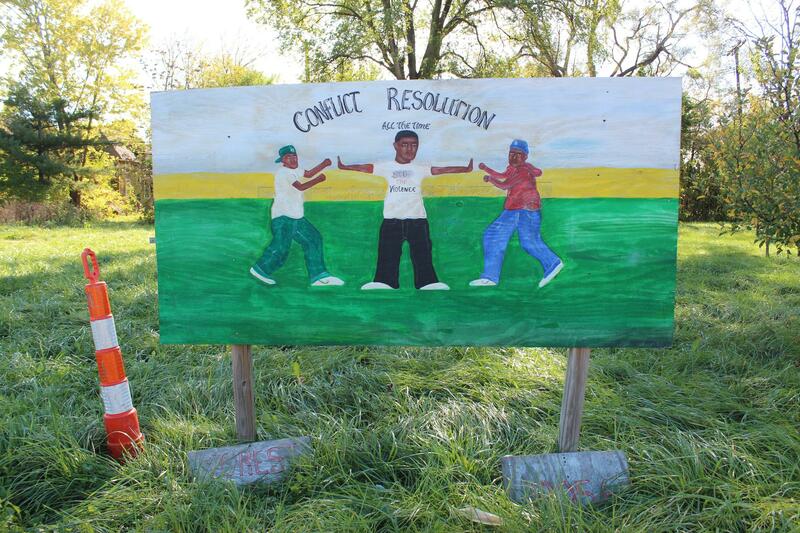 Sandra Hines (left) and Kim Redigan (right), flank young neighbors as they participate in a recent Peace Zones for Life discussion at Feedom Freedom Farm. She’s spent her entire life in Detroit and is a dedicated member of the Detroit Coalition Against Police Brutality. The organization documents police brutality cases and works as legal advocates for the families of victims. She's been working with the organization for more than 25 years. But it was around 12 years ago, that Hines worked on a case that shifted how she thought about her work. It started with a phone call. A young man named Dennis Crawford had been killed by the police. Crawford got into a fight with his girlfriend, and the girlfriend called the police. “When the police arrived, Dennis went to run to the back of the house to go out the back door,” Hines said. “She told the police, 'He's running to the back!' When they got to the back, he was coming out. They accosted him and engaged him in a battle. They pulled their guns out and killed him right in front of his family." Crawford was shot by the police, but his family blamed his girlfriend for calling the officers to the house. “They put out the notion that they were going to take her out and hurt her family,” said Hines. That's when Hines realized the coalition had to broaden its approach. It wasn't enough to end police brutality. They had to start looking at ways to end the violence within the community, too. And that meant getting at the root causes of that violence. “If you living under a lot of stress and a lot of pain, it's hard not to be angry and hostile sometimes in a lot of situations. When you don't have anything, then you want to take from others. That causes people to choose to go out and commit crimes when I don't think they normally would if they had better housing, better education, and jobs,” Hines said. Now, every month, Sandra Hines holds a meeting at Feedom Freedom. The people there talk about peace and how to build a more peaceful community. One of the ideas that's gained traction is Peace Zones For Life. Hines says it would be a physical space where neighbors could come together to resolve conflicts before they turned violent. “It’s time for us to really turn the news around, to where everyday your turn on the news there’s somebody being killed to somebody planting a garden. It’s time for us to literally take our communities back for real. We cannot wait another day because every day we wait, we see four and five more people killed. And so if nothing else to put it out in the universe that there’s a group of people that want to end this violence," said Hines. As appealing as the Peace Zone is, greater forces remain: a disjointed school system, ongoing home foreclosures, massive unemployment. “You just gotta keep doing it,” implored Hines. 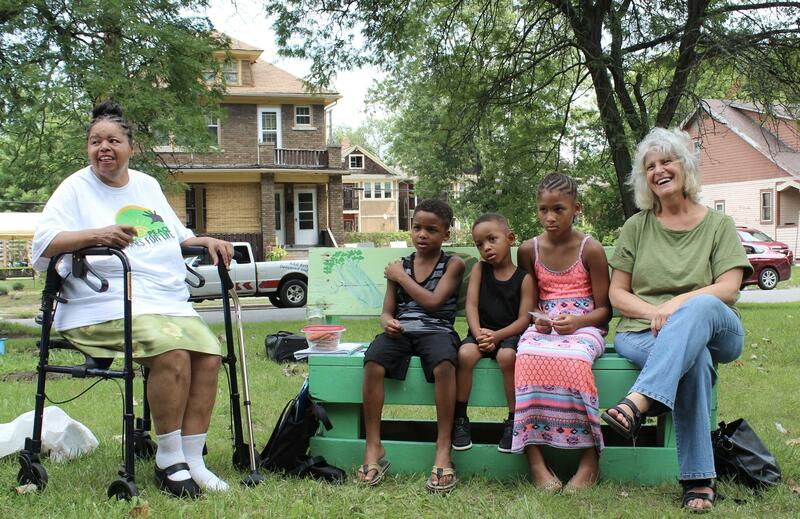 In addressing the the city's ongoing struggle with crime and violence, Peace Zones for Life are one inventive salve. Men of Purpose, another. Mothers of Murdered Children yet another. They're all necessary, along with the hundreds of other organizations, projects, ideas and initiatives unfolding all over Detroit. Like Sandra Hines said, persistence is key. “You just can't give in. It's no magic way to do it. It's going to take a long time. It's going to take a lot of work because things are not getting better. They're getting worse. It's an experiment anyway to see how it's going to work, but we just got to keep plugging at it. We can't stop. Yesterday, I reported a story about a community meeting. The purpose of this meeting was to help parents and children in Grand Rapids avoid potentially violent encounters with police. The meeting was organized by the Grand Rapids chapter of the NAACP, and most of the people who attended were black. The issue of police violence is relevant to the black community, in particular, because black people are more likely than other racial groups to be subjected to the use of force from police officers. Especially deadly force. So, that's an issue, and it's one we think is worth covering. But several people who commented on the story online wanted to know why no one was paying attention to what they deemed a far greater threat to young black people: so called "black on black" crime. In one comment, this was deemed a "less publicized problem." These comments struck me as odd, because I know we've done plenty of stories on that topic in the past, and I've been to plenty of community meetings meant to address community violence, including "black on black" crime.